Hey, everyone… Here is final review for this week. The last issue is ‘Wolverine: Origins’. Hope you enjoy it. RECAP: The issue opens with two prison officials discussing the day’s incidents and what they did to have Omega Red sent to their facility. Neither one has any answers. Next we find Lavrinenno calling the Russian Defense Minister Konstantinov with important news of a Wolverine sighting. The minister asks to speak to Logan and is told by Wolverine that he is on a personal mission but needs the minister to spread false information of his sightings to throw off Romulus. In the next scene we see that Wolverine has killed Lavrinenno while on the phone. We cut to Wolverine in a hotel room, he is tracking Victor, Romulus’ servant. Back in the prison and the only one that is willing to take Omega Red his food is an old prisoner dying of AIDS. He wants to be killed so he will not die alone. Red tells him he will not die alone but does not kill him yet. Next we flash to two men in Amsterdam who find the Carbonadium Synthesizer in the water. One kills the other and then is immediately shot dead by police. The cop is shown to be working for Romulus. Next we see Wolverine follow Victor onto a train, after a brief flash of Omega Red receiving his orders to attack, we see Wolverine continue tracking the blind man. The chase ends at a prison which is mostly destroyed and filled with death. We see the old prisoner’s body and the smashed door. 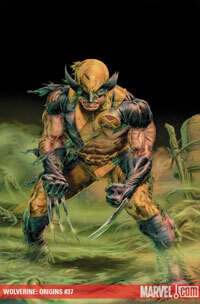 By the time Wolverine finds the Synthesizer and realizes he has been set up, he is in the coils of Omega Red. MY TAKE: This issue is a vast improvement over last month and one of the better issues of Origins I have read. It still has plenty of flaws, but there are some good scenes and a couple of nice attributes to the past. While the plot was simple and predictable, it made sense and was easy to follow. Romulus is more interesting in this issue, as well, since it shows how much power he has and how well he can plan ahead. I still do not feel, however, that Way has a firm hold on Wolverine’s personality. His killing Lavrinenno served no purpose and Wolverine does not kill without a reason. I was also surprised at how easily he fell into the trap. Even when he is eager, Logan is a hunter and he has amazing instincts. But even seeing the place destroyed and dead bodies all around, he never paused until he found that Carbonadium Synthesizer. The only real plot hole I saw was that the Synthesizer was still in the river where Wolverine threw it. It was a nice nod to the continuity but I would have thought that Wolverine would have made an effort to better secure something that is that important and valuable. Add to that it was left on the floor by Omega Red and I felt it was treated a little bit lightly. Wolverine’s inner dialogue felt more natural in this issue and so did his overall actions with a few exceptions. Wolverine was always a proactive person and it never seemed right that he did not make more of an effort to hunt down the man that was responsible for so many of his tragedies. It was nice to see him so focused and ready to tackle the problem head on. While I am always up for an Omega Red and Wolverine fight, his involvement in this seems a bit odd. Romulus only seemed to be interested in the feral type mutants and Omega Red is far from that. I can see why Red would be helping Romulus, the Carbonadium Synthesizer is reason enough, but not why Romulus wants his help. Maybe it will be explained in a later issue. In the end this was a decent if not amazing issue. It was far better then most of the Origins stories and I am interested in seeing what happens next month. It is still plagued with enough problems to be noticeable but I hope we are in for a pretty good story arc. 2 Comments on "Wolverine Origins #37 Review: The Hunt Begins"
You’re very welcome. Hope you enjoyed it.